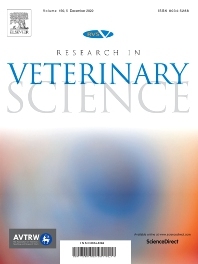 Research in Veterinary Science is an International multi-disciplinary journal publishing original articles, reviews and short communications of a high scientific and ethical standard in all aspects of veterinary and biomedical research. The primary aim of the journal is to inform veterinary and biomedical scientists of significant advances in veterinary and related research through prompt publication and dissemination. Secondly, the journal aims to provide a general multi-disciplinary forum for discussion and debate of news and issues concerning veterinary science. Thirdly, to promote the dissemination of knowledge to a broader range of professions, globally. High quality papers on all species of animals are considered, particularly those considered to be of high scientific importance and originality, and with interdisciplinary interest. The journal encourages papers providing results that have clear implications for understanding disease pathogenesis and for the development of control measures or treatments, as well as those dealing with a comparative biomedical approach, which represents a substantial improvement to animal and human health. Studies without a robust scientific hypothesis or that are preliminary, or of weak originality, as well as negative results, are not appropriate for the journal. Furthermore, observational approaches, case studies or field reports lacking an advancement in general knowledge do not fall within the scope of the journal.